Judy handled the front and said, “The shoppers certainly seemed appreciative as well because we had great crowds both days and they came here to buy for home and holiday décor as well as presents.” Many dealers, she added, reported good sales in furniture as well as the smaller antiques that might have been accessories or presents. Wilori Antiques from nearby Rochester, N.Y., sold at least six case pieces, including a large cupboard, which presumably came from a ship; a lift top New England blanket chest, grain painted in faux mahogany; another trunk, probably made as a sea chest in the early 1800s, refinished and ready for the family room as a coffee table; a simple farm table, pine top with turned lags; and, finally, a chest of drawers, Nineteenth Century, probably New York State. 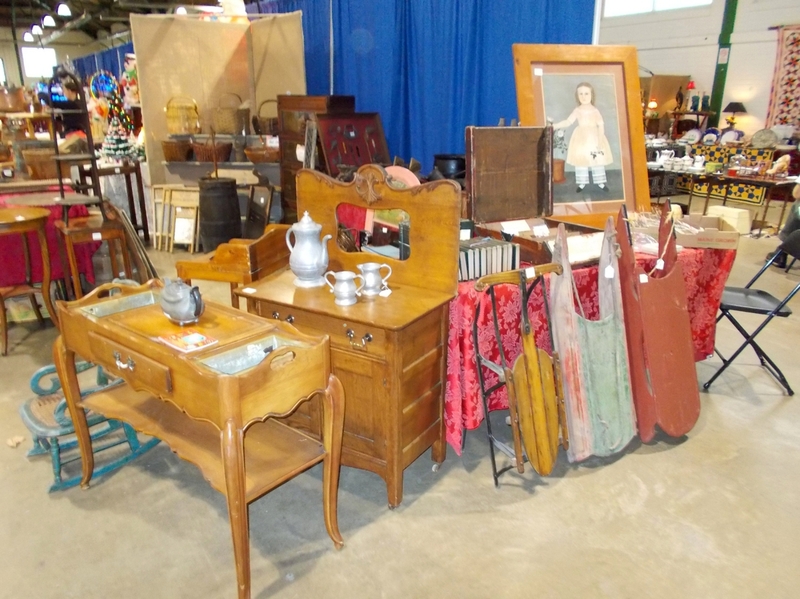 The dealer also trades in stoneware and other small antiques, which sold well this weekend. 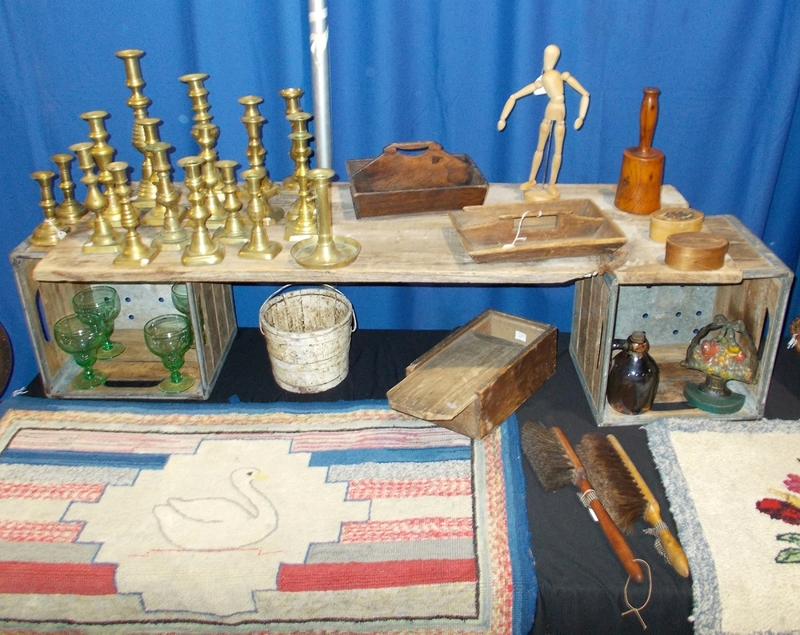 Mike Gallant, Hometown Antiques of Glenburn, Maine, came to the show with a collection of all small things. 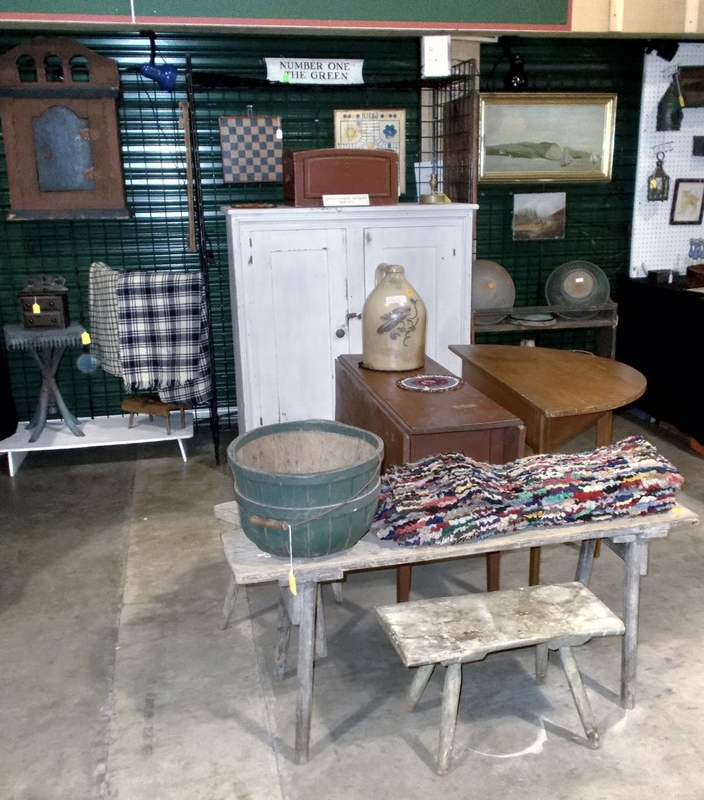 He specializes in antiques that Maine is known for, such as hooked rugs and mats, primitive woodenware, such as pantry boxes and kitchen utensils and Eighteenth and Nineteenth Century toys. Sharon Green Antiques, Sharon, Conn., showed a collection of Eighteenth and Nineteenth Century Georgian furniture along with silver whimseys displayed in showcases. 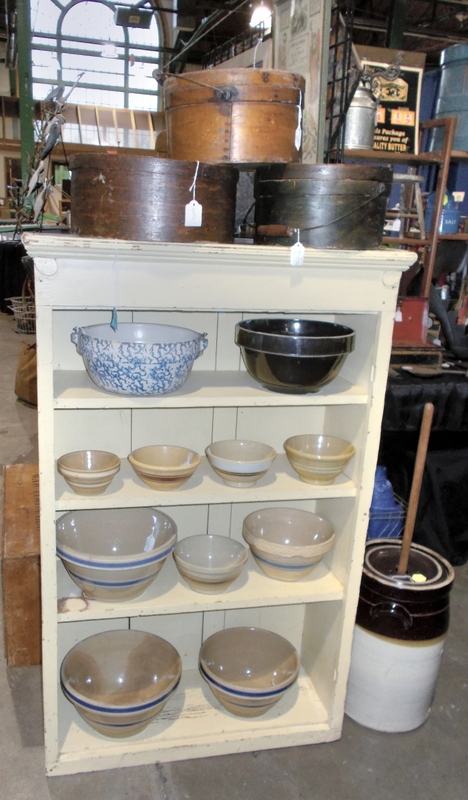 For the weekend, sales were good, selling an early Nineteenth Century tiger maple server, not refinished. 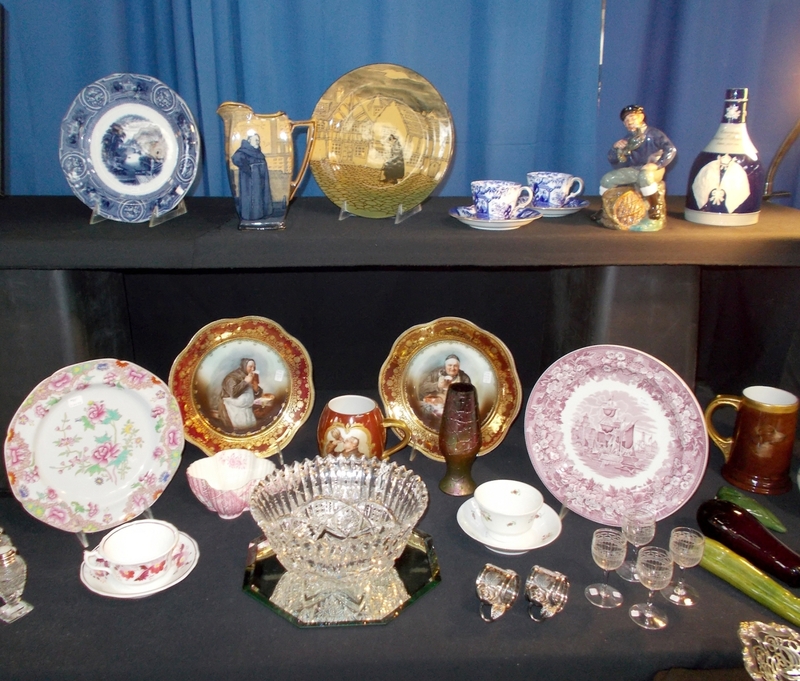 Sales also included a large number of items from the showcases, including several silver overlay perfume bottles, unusual silver service pieces, a few inkwells and more. Collectibles are a big part of the show, and D.M. Day Antiques, Athens, N.Y., brought a large assortment of small ceramic animals made about the turn of the century. 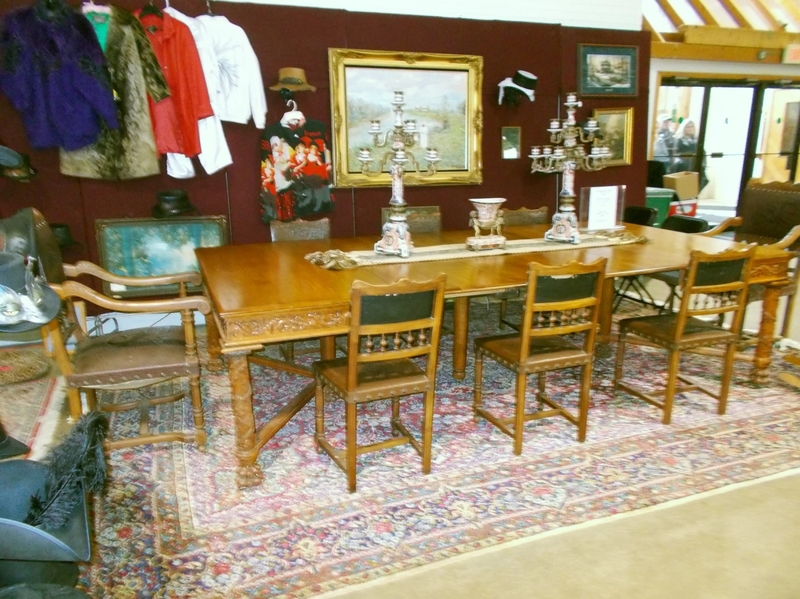 His collection also included furniture for doll houses, art and some textiles. 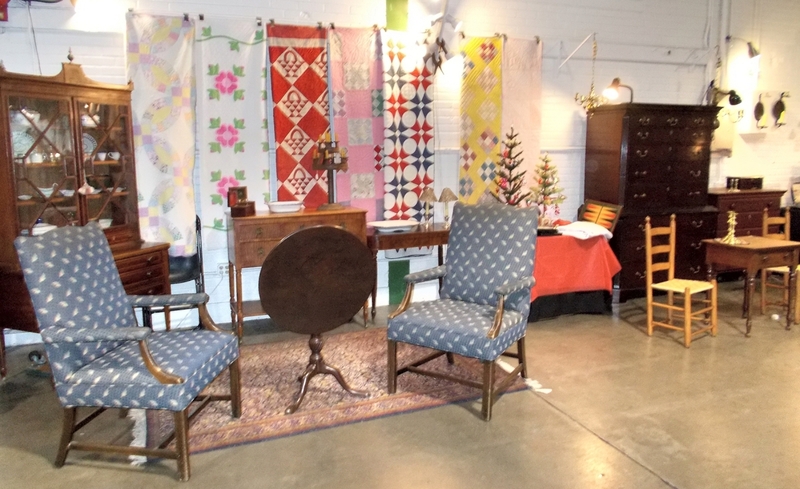 From New Hartford, N.Y., Tony Perretta was selling well, with furniture and accessories. 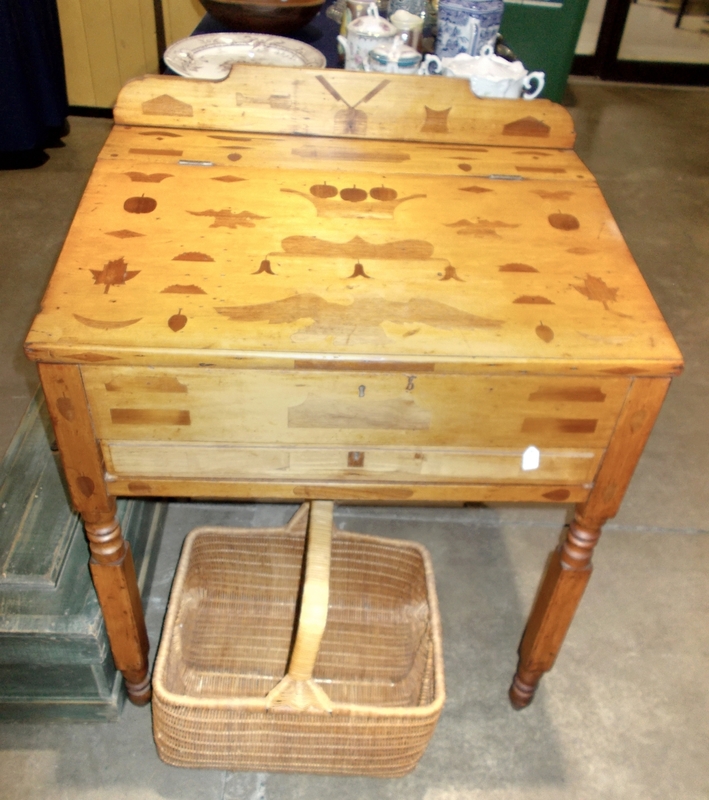 His desk was drawing great interest, a small lift top, probably mid-Nineteenth Century in mixed woods, with inlays of many different patriotic objects, including eagles, maple leaves, apples, an inkwell with pens and more. Judy Allman greets a large opening crowd the last minute before the Saturday opening. Bob Lavallee is a Baltimore, Md., dealer who started exhibiting more as a hobby. Now that he has retired from his former profession, this is a full-time vocation. His passion is for unusual little objects that elicit questions from the potential customers. 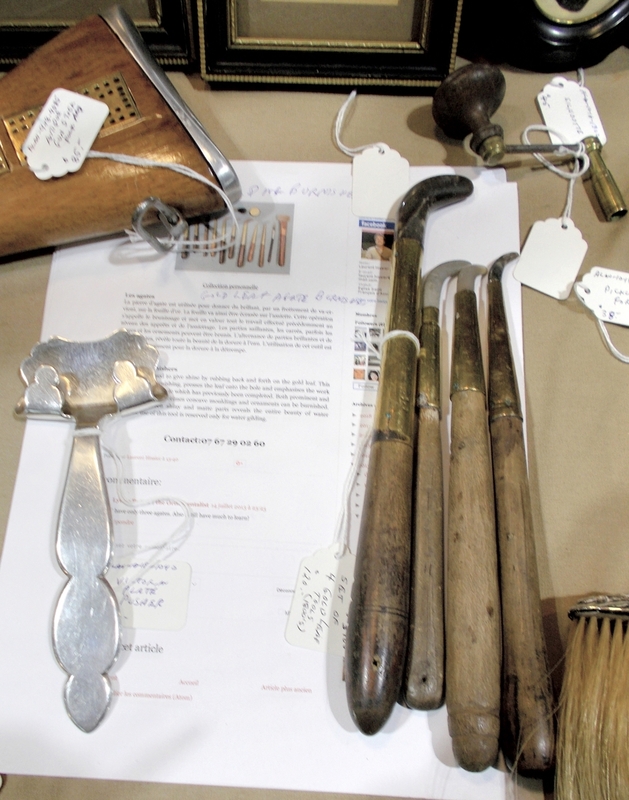 This weekend two of the most often questioned items were several gilt burnishers and a silver plate pusher. A gilt burnisher was used to smooth out the wrinkles when applying gold leaf to an object, while the silver plate pusher lifted or pushed a hot plate of food into place at the table – silver plate because it would conduct less heat than sterling, allowing the user more time to move the plate. 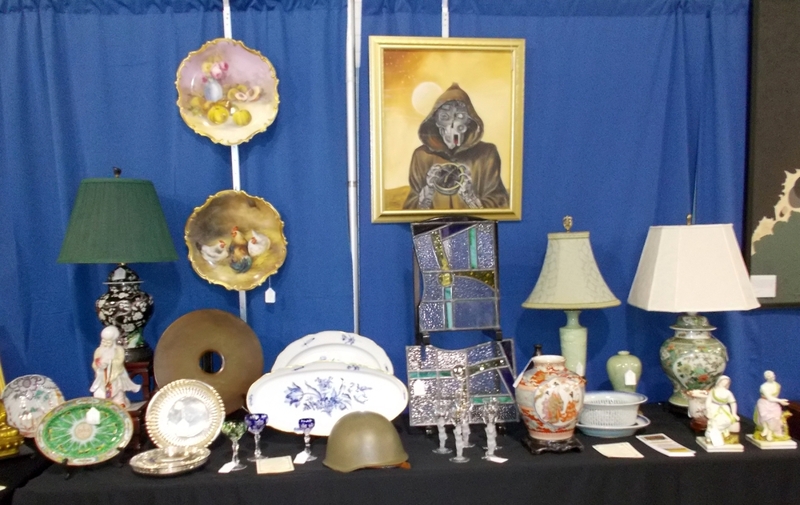 Sandra Willson, Churchville, N.Y., exhibits a large collection of silver and porcelain dinnerware. This month she featured hand painted Nineteenth Century sets and individual pieces. 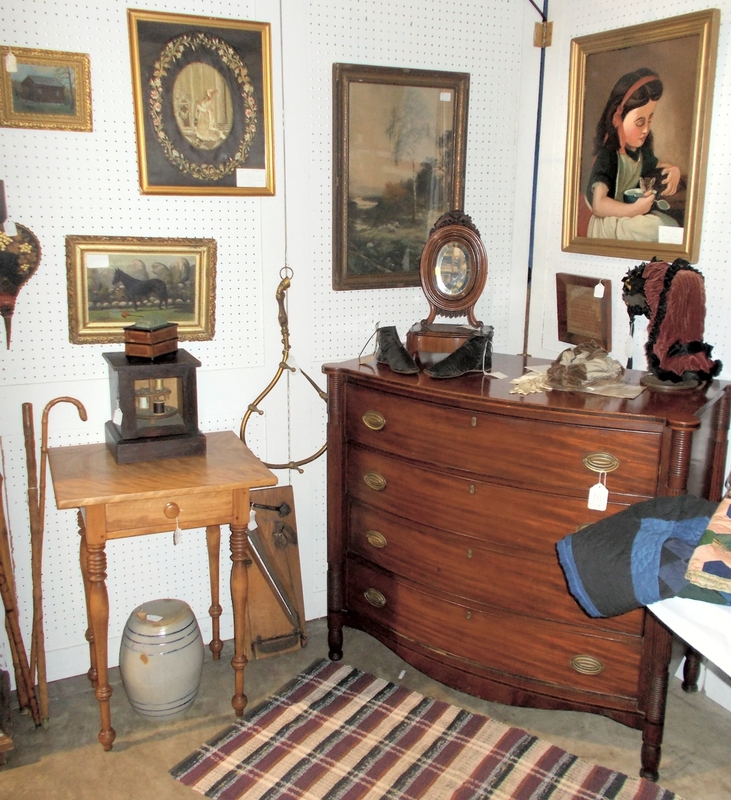 Horsefeathers Antiques, Delhi, N.Y., showcased small Eighteenth and early Nineteenth Century home and farm pieces. The owner, Tom Newcomer, has an affinity for early country-style antiques, so this is what he collects and trades. 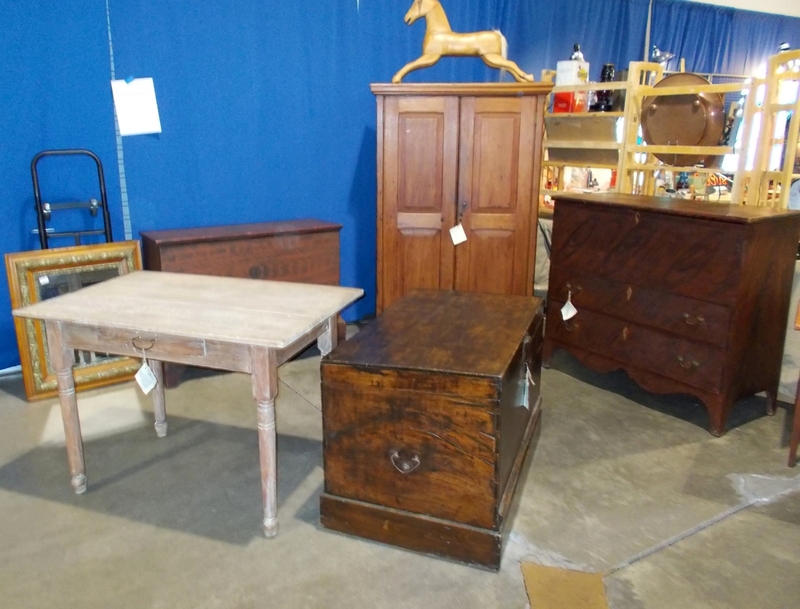 Sales were good in the category this weekend, including a 200-year-old small dome top wooden box in red paint with modest decoration; several game boards and several pieces of painted furniture. Baltimore, Md., auctioneer Glenn Freeman brings so many little things he needed the help of both his wife and granddaughter to put together the exhibit. The collection is largely assembled on buying trips to England and other parts of Europe, so there are charming little things in silver, glass, porcelain and more. 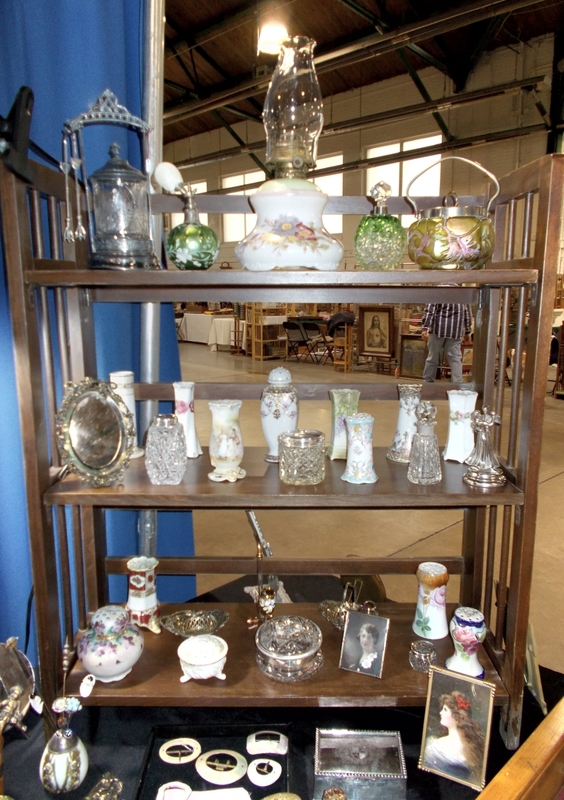 He sold many unusual silver serving pieces, perfume bottles and chatelaines, antique and vintage inkwells and an assortment of early photograph frames in various materials. 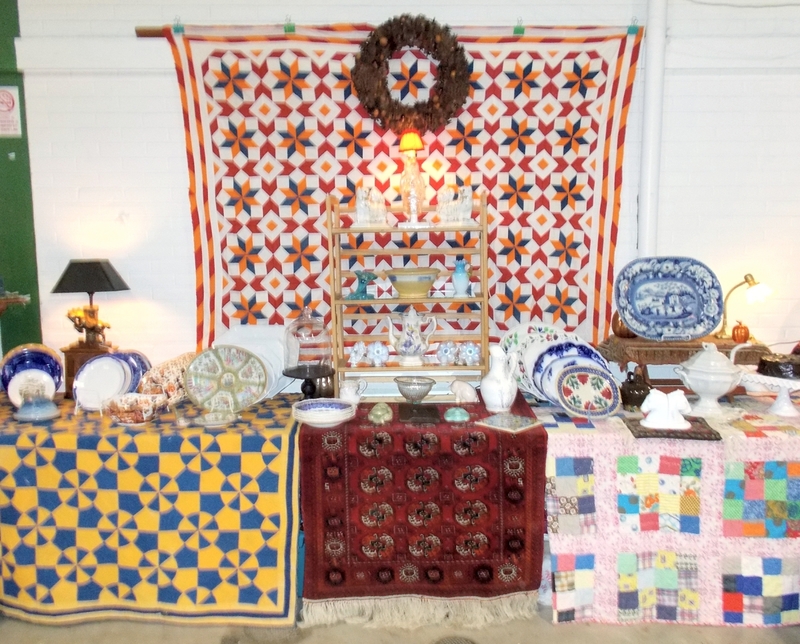 Gary Smith, Big Flats, N.Y., sold some of his quilts and earthenware. Back By Popular Demand, Pepperell, Mass., was offering Nineteenth Century country painted furniture, which sold. Dannette Darrow, Binghamton, N.Y., sold from her collection of Chinese Rose Medallion. 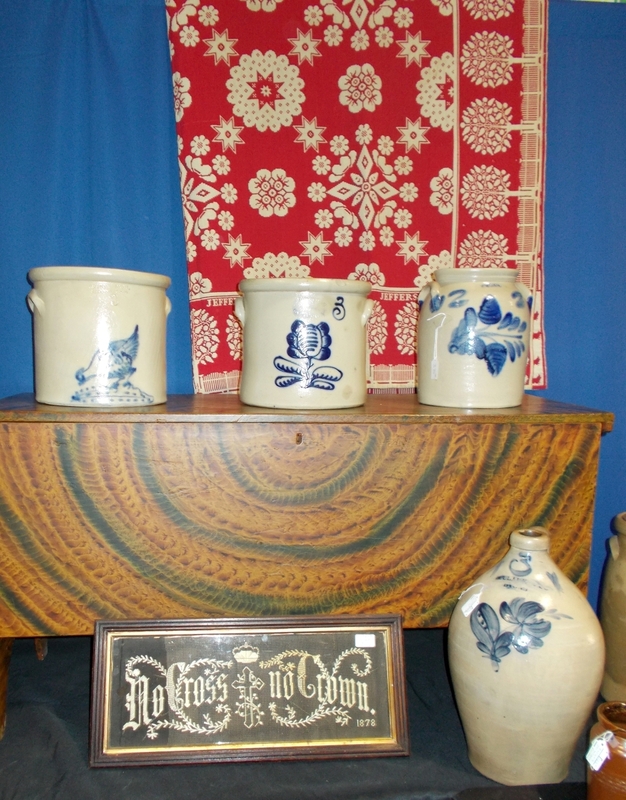 Todd and Cheri Charboneau, Honeoye Falls, N.Y., parted ways with yellowware and mocha from their inventory along with early advertising. 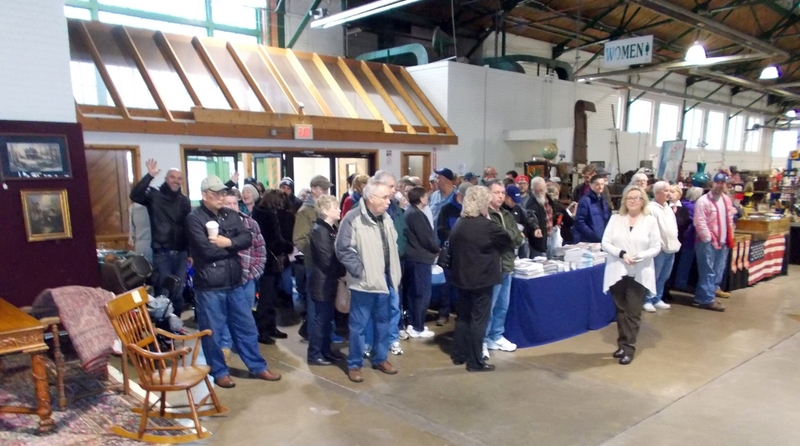 Allman Promotions’ next show here is in the larger Center of Progress Building, 581 State Fair Boulevard, Syracuse, N.Y., January 19-20, with about 200 dealers. For information, 239-877-2830 or www.allmanpromotions.com. The Allmans also produce a series of Florida shows starting the first weekend of January.